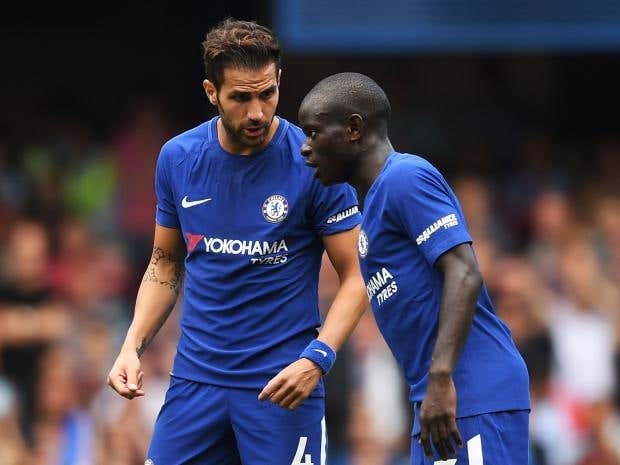 Chelsea manager Antonio Conte has admitted that Cesc Fabregas is trying to become more like N'Golo Kante as he looks to improve on his defensive game. The Spain international was surprisingly picked ahead of Tiemoue Bakayoko against Everton, but the move paid off as he bagged the opener in the 2-0 triumph. Fabregas has always been one of the best passers in the English top-flight, but his inability to hold off opponents while defending has been a cause of concern. Speaking after the Blues' win, Conte admitted that Fabregas is working hard in training to perfect his skills as he looks to become stronger like Kante. The Italian also had a similar advice for Kante, who he believes should work more with the ball - similarly to Fabregas. He said: "Cesc played a good game. Like Cesc, all the players performed very well. He scored an important goal for us. We all know his characteristics. He's a great player, good technique: when we have possession with Cesc, we can play really good football. Now he's trying also to improve the defensive situations to try and be stronger, to try and be a bit like N'Golo. But he has to work (on that). And N'Golo has to work to become Cesc with the ball." Cesc Fabregas has got the nod over Bakayoko for the early stages of the campaign, but the Spaniard would be aware that any drop in performance could see him back on the bench. Danny Drinkwater of Leicester City is also on the cusp of joining the Blues, and this is likely to add competition for the central midfield role alongside Kante. The Blues have more than made up for the opening day defeat against Burnley with victories over Tottenham Hotspur and Everton - both of whom are expected to challenge for a top-four place in the Premier League.